In its second year, Mission Greenhouse changes the lives of 28 POET team and family members and creates lifelong friendships with the young students of Travellers’ Oasis Centre. Ten days. Four eight-hour flights. 8,000 miles. 28 near-strangers. 170 students. One goal. 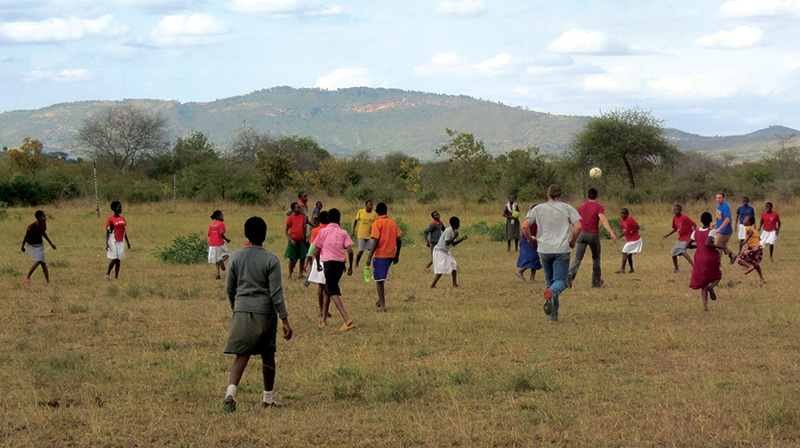 POET team members play soccer with the students at Travellers’ Oasis Centre. When I arrived at the Sioux Falls Regional Airport on June 6, 2014, those were the only solid facts I had about the journey I was about to embark on. The past several months had been a whirlwind of travel preparation and fundraising, so I think I can speak on behalf of everyone when I say that the day of departure felt very surreal. Most of us, myself included, were brimming with excitement. Some of us were traveling in packs; I was accompanied by my mom, my sister and my best friend. Others were going alone. 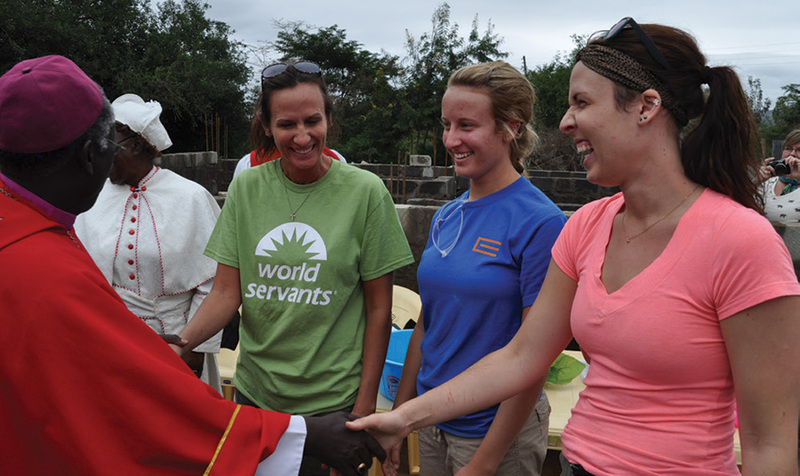 Looking back on that day makes me laugh because, having experienced a life-changing week in Kenya once before, I thought I had a good idea of what to expect. I would quickly be proven wrong. The travel portion of the trip is kind of a blur. It was a never-ending cycle of security lines, layovers, flights that spanned eternities and attempting to keep track of the wanderers of the group. Even though it was by far the most unspectacular portion of our adventure, I am very grateful we had that time to start building relationships with one another. 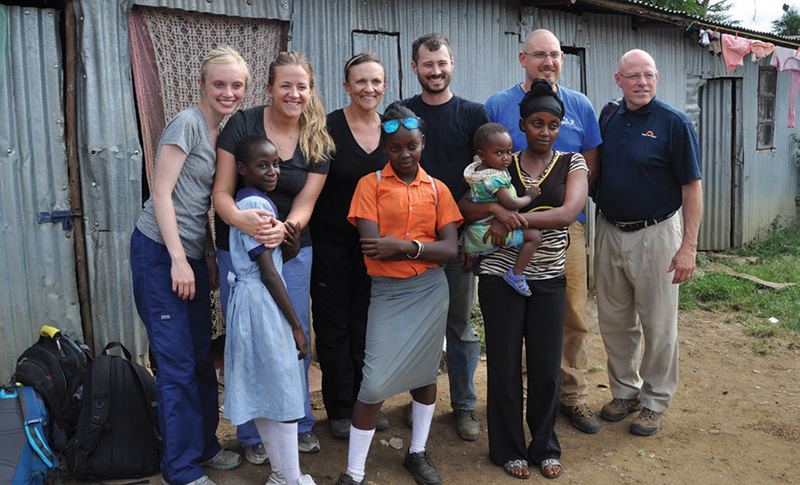 By the time we reached our destination, I could already tell we had started to become a family. To me, landing in Nairobi felt like coming home. 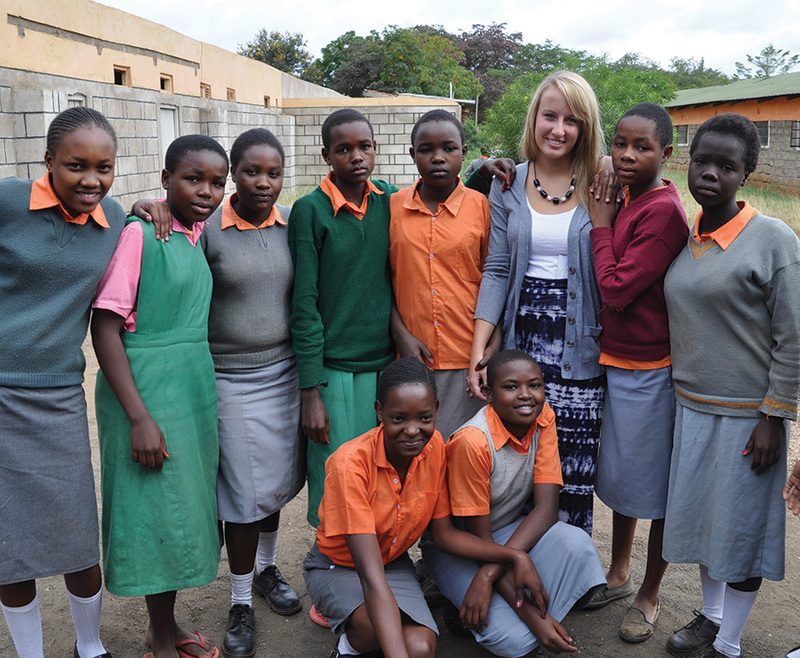 I had left my heart in Kenya on my previous trip, and I couldn’t wait to start round two. We spent one brief night in Nairobi, and then received a little cultural training the next morning before loading up on buses to head to Sultan Hamud. The first stop we made once we got to the village was at what would be our home for the week, the Miryam Village Inn. I was blown away by both the good conditions of the hotel and by the people who worked there; we got to know them on a more personal level by the end of our stay, and they were all truly wonderful. The building itself was great too, and it was very easy to get settled in. 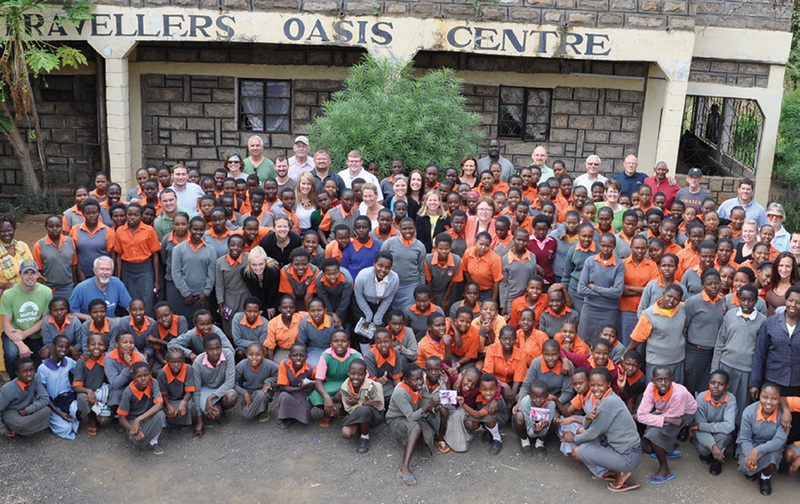 Then we set off once again for what I would say was a turning point for all of us: meeting the girls at the school. Miranda Broin bonds with the students at Travellers’ Oasis Centre. 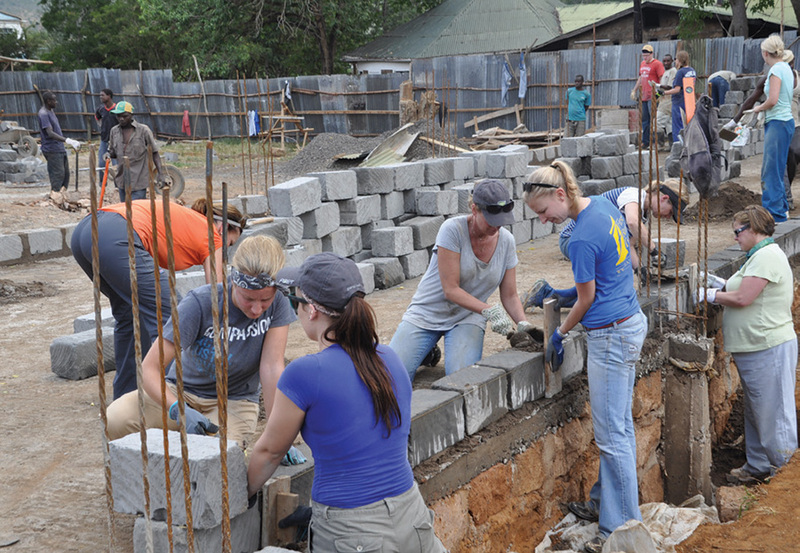 Miranda and Alyssa Broin, Debbie Anderson and Kayla Schlechter apply mortar and lay brick to form the dormitory walls. 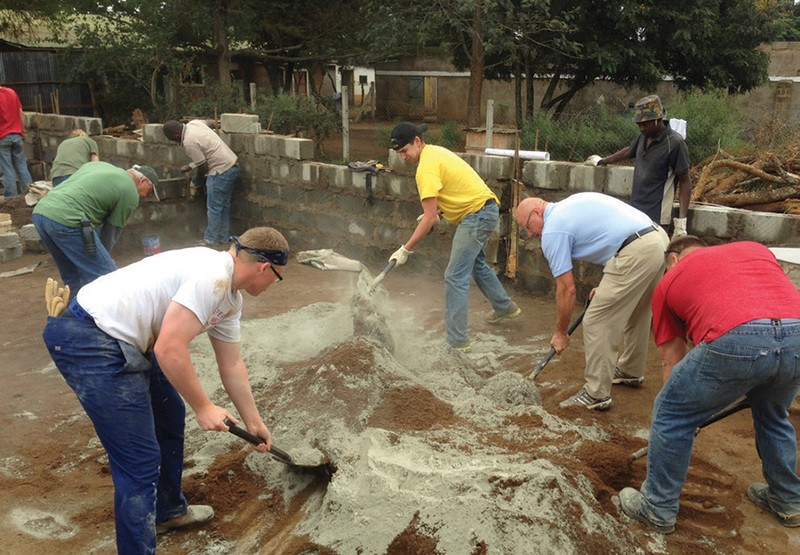 Trevor Peter, Dennis Ausborn and Scott Radigan mix cement. Before I continue, I should probably provide a little background information on the previous trip. Last summer, another group of POET team members took a trip to the same location to launch Mission Greenhouse. The name of the project is pretty self-explanatory; they spent their time building greenhouses at an all-girls boarding school called Traveller’s Oasis Centre (TOC) founded by Esther and Shadrach Muiu. POET has since adopted the school, so our group was sent back to the same location to continue work there. Our mission was to assist a team of local workers in the construction of a new dorm block for the girls. As our buses pulled up to the school that first day, I remember the sounds of our chattering dying away in correlation with our growing smiles. Girls of all ages, clad in their well-worn orange and green uniforms, hurried around us in the direction of the little chapel, every one of them stopping to wave and shout hello. Faces peeked out of the building’s windows, lit up with the sort of welcoming grin that only Kenyans possess. We were ushered into the chapel for a welcoming ceremony, where we had the privilege of hearing the girls sing for the first time. If there is a sound on earth more beautiful than the pureness of their voices belting praises to God, I’d like to know what it is. I guarantee there was not a dry eye amongst the 28 of us in that moment. I couldn’t imagine any better way to inspire us for the week ahead. The next few days consisted of variations of one very busy schedule. We would get up early, some earlier than others to walk around the village. Then the whole group would eat breakfast and pray together before leaving for the school. We would spend the morning working alongside the construction crew, performing countless miscellaneous tasks. These included, but were not limited to, mixing cement, hauling blocks, laying mortar, moving branches, moving the same branches somewhere else, cleaning blocks and the list goes on and on. Truth be told, it was a lot of manual labor and we actually relished every second of it. Within the hours of work were hundreds of special moments that I will always carry with me and I am truly grateful to both the POET team and the spectacular Kenyan people for blessing me with them. POET team members and the students at TOC took one final picture before heading home. Katherine Veenis, Courtney Heitkamp, Suzanne Veenis, Brad Heggeseth and David Carlson visit the home of one of the TOC students. Tammie, Miranda and Alyssa Broin are recognized for their contributions to the school during a ceremony to bless the cornerstone for the dormitory. We did a lot of working that week, but I think it’s safe to say we did even more playing. Our group was awarded two tea times a day, one halfway through the morning and one in the middle of the afternoon. The construction crew liked to give us grief for it, but for a lot of us, tea time was one part of the day that we all looked forward to. I’d travel across the globe for some of Esther’s African tea any day and I certainly didn’t mind the company either. Aside from tea time, the best part of each day was undoubtedly the few hours we got to spend with the girls. Of course it was a blast teaching them games and songs, making crafts, and playing soccer with them – or, in my case, watching everyone play soccer with them from the safety of the sidelines. My favorite part of that time, however, was simply getting to talk to them. I could go on for pages about what outstanding, intelligent, Godly, young women they all are. Many have difficult backgrounds, but none of them are letting that hold them back. They dream of being doctors and lawyers and teachers, of making an impact on their world, and I don’t doubt for a second that they can. Because of TOC and all Shadrach and Esther have done, those girls have real opportunity to turn those dreams into reality. I feel so grateful to be able to watch as their futures unfold. After several days of work, the dorm starts to take shape. I pray that it is in God’s plans for us to meet again next year and hopefully in the many years to follow. For now, however, holding on to the experiences from that week will be enough. Ten days. 170 new friends. One big family, no longer strangers. Thousands of incredible memories. And, in just ten days, the realization that it is possible to have your life changed more than once. If you’re interested in donating to Mission Greenhouse, visit worldservants.org/poet.